As “Parts Hunter” here at SparkFun, I have the privilege of interacting with a variety of suppliers, manufacturers and their representatives as a regular part of my job. Today, I'd like to highlight a particular company whose name may already be familiar to many of you — Weller Tools. Weller (part of Apex Tool Group) has been kicking out innovative soldering tool designs since the 1940s. 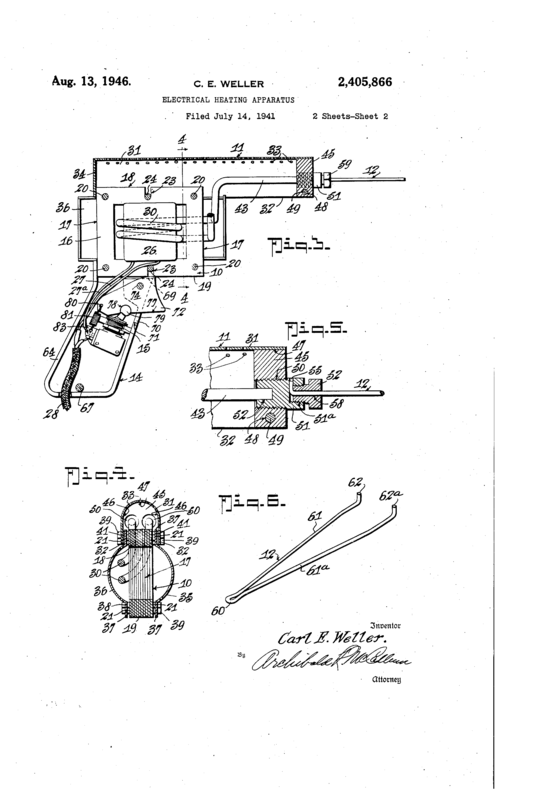 An American radio repairman named Carl E. Weller, dissatisfied with the long periods spent twiddling his thumbs waiting for his old-timey soldering iron to heat up, first patented the “Weller Electrical Heating Apparatus” in 1941. It looked like a ray gun straight out of “Buck Rogers,” and it paved the way for so many of the soldering tools we've come to love and cherish in our modern age. Today, Weller offers a wide array of tools for hobbyists and professionals alike, including the Erem and Xcelite brands of hand tools. I asked Pete Jenner, Field Application Manager for Apex, to outline some of the most unusual soldering applications he's assisted customers with, and his answers did not disappoint. Number one on his list was—drum roll—SOLDERING IN SPACE! The video below shows the mesmerizing results of this experiment. Other unexpected uses of Weller irons he's encountered include cauterizing tissue around wires used to make pediatric aortic stents, and melting a composite material to fill seams and rivets on Air Force jets to help make them stealth. Pete also mentioned the artist market for soldering irons used to create stained glass and burn designs onto wood. How long have you been repping for Apex/Weller? I have been an Apex rep for nearly three years now. It has been a fun and rewarding experience. I get to see amazing processes and sell fun tools. What are some of your favorite Weller tools for your own use? I do have my "go-to" tools from Apex/Weller that I use all the time. I have two Erem cutters that I love, an older WD1 solder station for bigger jobs and a 12W rechargable soldering iron (my new favorite for small jobs). Can you describe a favorite personal project for which you've used Weller tools and/or SparkFun products? The most rewarding project this summer was a prototype product of my own design that I plan to release to market next year. I bulk purchased a number of parts for this project from SparkFun. Unfortunately I can not disclose what that project entails, but I now have enough parts to build 300 units thanks to SparkFun. All other parts are 3D printed. The project I just finished this week is a Jack-in-the-box [pictured above] with several different LED bulbs purchased from SparkFun. This one can be seen on Instructables under Snake-in-the-Box. Lastly I built an electric motorbike for my wife this summer that I am very proud of. This project can be found on Instructables under "Battery Powered Motorcycle" by Schockmade. That about wraps up our "Supplier Spotlight" look at Weller! Be sure to check out Mike's projects above and have a gander at SparkFun's Weller, Xcelite and Erem offerings. 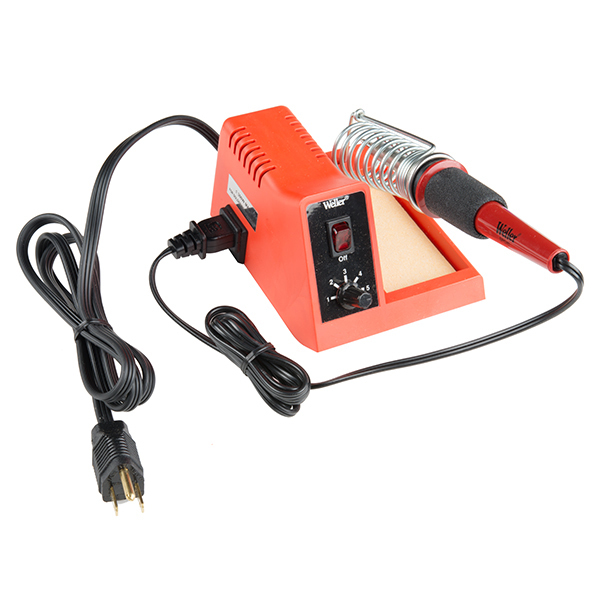 I will close with a question for you, dear readers -- what are YOUR go-to soldering tools? I have a couple favorites, I've used Metcal at work- nice, and so easy to change tips. For myself, I've given up on ANYTHING that is not temperature controlled- I would consider a butane iron for emergencies, but a temperature controlled iron does everything better. They heat up faster, they are less likely to destroy boards and components, tips last far longer, are less of a fire hazard- they are just better (for any use of your soldering iron that is actually soldering). I'm curious about the results of that NASA microgravity soldering experiment... looks like circuitry repair in space may have some significant challenges. "Real-time downlink video of the experiment yielded direct observation of the solder melting, equilibrium shape attainment by the liquid, and flux movement. The flux movement was particularly noteworthy because it was entirely unexpected. When the flux was released from the solder during heating, it formed a droplet that spun around the larger solder drop. This surprising movement is driven by thermocapillary flow induced by the temperature gradient. This type of behavior cannot be duplicated on Earth." Hey Brambleton, Nice post and thanks for sharing! Wow that soldering in space movie was so awesome to watch. I did not expect the top of the solder wire to start melting first. (I thought it would collapse at the point where the soldering iron tip was touching). And the spinning flux was also a surprise. So cool! FWW, at my soldering station at home, I still use (and love) my old weller iron. When I first took the hook here at SparkFun, I decided to spend a little more and have something that would last, so I bought a nice blue weller. It's lasted me over 11 years, so it was way worth it! Thanks to Mike Schock for sharing those projects. What a fun Halloween project. Does it randomly pop, or does the rotating of the front thingy play into the timing? QCPete, The door pops open at one full rotation of the snake head knob. I turned it back and forth in the video just to illustrate the movement of the heads on the side of the box. This project was made in an attempt to try to build something a little more complex with my 3D printer. Usually I make some light-up pumpkins or something simple for Halloween.